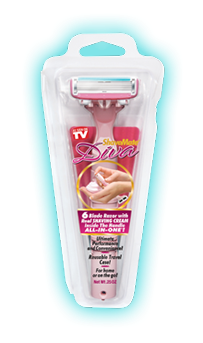 All-In-One: Everything you Need to Shave within the Palm of Your Hand! 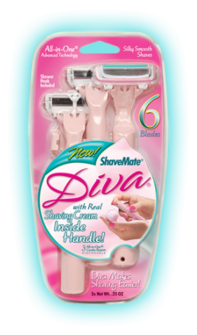 Watch Out Pesky Hair There's a New Diva in Town! 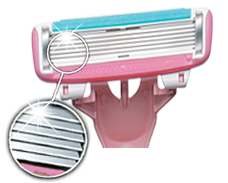 6 Premium blades and a handle full of pink shaving cream; All-in-One… need we say more? Sure we will, this Diva is packed with innovation from a flexible neck that maintains even pressure to the slim pivoting head that hugs your curves and fits into delicate areas. Traveling is hard enough, simplify your trip, bring your All-in-One ShaveMate along! Love that! 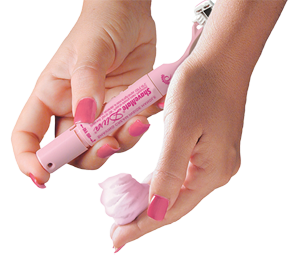 Ingeniously versatile load-lighting invention that will make your beauty routine fast, easier and maybe even a little more fun!